The Fuel fro School project will deliver the outlined below to partnered Primary schools •	Provide up to half a day training around food waste issues twice a year for the school’s named lead practitioner. •	Allow the school to access online resources to further Fuel For School’s aims including model risk assessments and recipes. •	Deliver an assembly to the school to highlight the aims of Fuel For School. •	Provide the school staff training to highlight the aims of Fuel For School. •	Secure the provision of food to the school on a weekly basis at an agreed time either during term time only or throughout the whole year. •	Allow the school to use the PAYF model. •	Support the school by providing advice to enable it to establish facilities such as a PAYF café or PAYF market stall. •	Provide Ofsted updates to the school on issues around food and healthy eating. •	Provide to the school a model policy on hunger. Fuel for School aims to educate the next generation on food waste to combat the current environmental impacts of food over production. By diverting surplus food from landfill into Primary schools and offering education around this we can not only highlight the volume and senselessness of food waste to children, we can also allow families on low income access to surplus food on a PAYF basis. By concentrating on the environmental impacts of food waste some of the social issues of food poverty can be dealt with without highlighting or stigmatising those that need it. Inclusive environments can be created allowing everyone to feel equal and are empowered to make a change against food waste. Fuel for School will provide a range of surplus food to schools that can be made into nutritious meals. the food delivery will also support the education pack that will develop children's skills and knowledge around food, environment, cooking, nutrition, recycling and growing. the educational pack provides a range of activities suitable for years 3,4,5 and 6. Each has been carefully designed to foster inclusion, and facilitate differentiation, and all activities support and enhance the delivery of the National Curriculum whilst empowering the next generation to make a real difference as part of TRJFP campaign against food waste. The links to the National Curriculum are identified within each individual activity set out in our educational pack. In addition to support national curriculum learning it also supports a lot of social development in children. Food is the one thing that everyone has as a common ground so it helps to break down a lot of barriers, children are able to help out with checking in the food deliveries, running market stalls, researching new foods, cooking and developing meals and much more. our current partnered schools have reported improved to engagement with others and development confidence and emotional resilience in pupils. Advancing the education of the public about all aspects of food waste generation, waste management and waste recycling. It is environmental and sustainability project. The long term aim of the project is to demonstrate the scale and senselessness of food waste, and the most productive transfer of this energy, is to make it accessible to everyone feeding bellies not bins, provide grass roots education and create inclusive environments for all. TRJFP opened the UK’s first Pay As You Feel café in Armley, Leeds in Dec 2013. TRJFP has evelved the PAYF concept to a whole new level to come from an environmental angle and focus on abolishing food waste, rather than focussing on food poverty as a central issue. It chooses not to focus on financial donations and allow customers to offer, their time, money or skills in return for the food. The evolution of this concept - Stops the de-valuing of food – allowing people to recognise the value of food in money, time, skills and energy inviting customers to get involved in the project, and to consider the amount of energy, time and cost has gone into growing, storing, processing and transporting this food, it deserves to be recognised. Values the individual – it creates an environment where people can give anything they want in order to have access to our food and service. PAYF has empowered and inspired communities of people to come together and feel responsible for a hub of activity within their towns and cities. It has broken down social barriers and stigmas surrounding access to food. It does not act like a charity, no referrals are needed, and the model avoids the stigma that can accompany food banks and other projects that only welcome those on limited incomes. 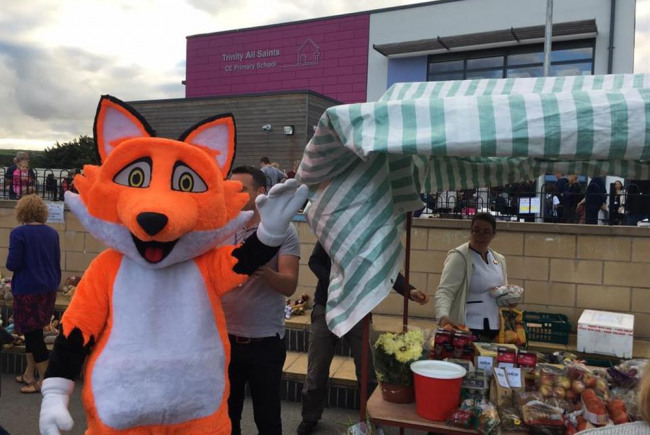 In Nov 2015 the UK’s first PAYF café opened inside a primary school Leeds. The recognition of hunger as a barrier to learning led to the creation of Fuel For School, To empower young people to REALLY feed the world by Removing hunger as a barrier to learning and to improve educational outcomes for the children of the school.Enabling schools and their families to have access to surplus food on a Pay As You Feel (PAYF) basis.To educate children about food waste issues. Project Delivery Manager: The Real Junk Food Project The Project Delivery Manager takes legal responsibility for receiving and spending the funds raised and ensuring the project is delivered.